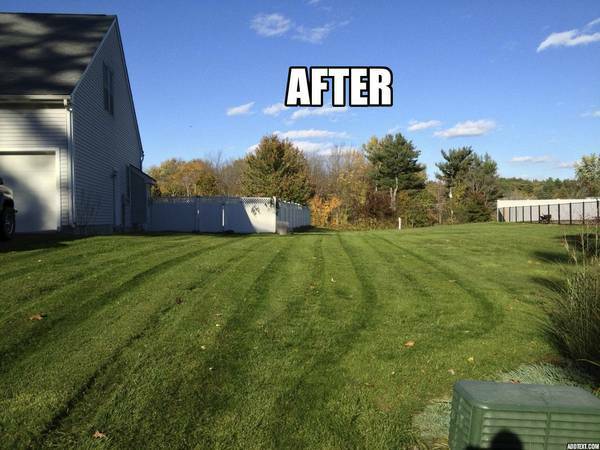 Organic Lawn Care - Koehler Landscape Construction Services, Inc.
We now offer topdressing and organic lawn care for Amherst, Bedford, Brookline, Hollis, Merrimack, Milford and Nashua NH! What is topdressing lawns or beds with organic compost? 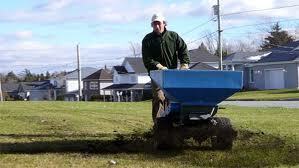 Topdressing is the process of adding a thin layer of material over the surface of turf. A variety of materials can be used in a topdressing program including sand, soil, and compost, as well as mixtures of sand and composts. Adding materials in very thin layers over the surface of turf makes it possible to add organic amendments and gradually change the soil without disturbing the actively growing plants. How do we apply organic compost to your lawn and beds? 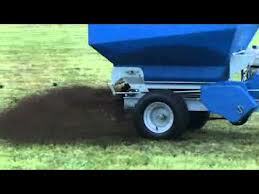 Topdressing with compost can be performed successfully using a variety of methods and equipment. For small areas, compost can be broadcast by hand and distributed over the lawn using a rake. For large areas a variety of equipment is available. The Ecolawn Top Dresser is a motorized applicator developed specifically for topdressing; it is very versatile and works well for topdressing turf with compost in particular. We looked at and tested the best ones in our industry and chose this one. Equipment used to top dress compost are operated to apply a layer that is from ¼ to ½ inch thick in an even manner. Aeration of turf immediately before or after application of the topdressing is commonly performed and will aid in the incorporation of the compost into the soil. 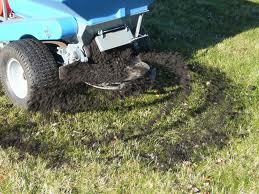 Core aeration when performed with compost topdressing will decrease soil bulk density and improve water infiltration. If there is excessive thatch we also dethatch prior to core aerating and topdressing. Irrigation of topdressed areas immediately following application of composts is often desirable to enhance the integration of the compost down into the turf. Addition of water will also facilitate movement of water soluble nutrients into the root zone and stimulate the microbial activity. If topdressing is performed during dry summer months, the irrigation of topdressed areas is highly suggested to reduce stress. The ten benefits to the turf cited below may or may not be readily observable to the compost user. The general observation most often reported, improved turf appearance, may be attributed to a variety of specific responses caused directly or indirectly by the application of composts. Although some impacts (e.g., a deeper green color) may be observed soon after application of compost, other results are more subtle and not as readily observed. For example, composts add organic matter and beneficial microbes that have been shown to reduce turf diseases; however this disease suppressive benefit would not be observed when the diseases are not present or when the weather conditions favoring disease outbreaks do not occur. In addition, impacts on soil properties through compost topdressing may require repeated applications over a period of a few years. Perhaps the primary and most often recognized benefit from using compost is the provision of nutrients, food for your lawn! Composts will contain a range of both macronutrients (e.g., Nitrogen, Phosphorus, and Potassium) and micronutrients (e.g., Manganese, Boron, Zinc, and Copper) largely in an organic form. These nutrients will be released slowly as the organic matter decays. Unlike conventional inorganic fertilizers, the nutrients in composts do not dissolve or break down quickly and therefore are not readily lost during periods of precipitation. Thus one of the benefits of using compost is how it provides nutrients in a slow-release form. Because the nutrients in the composts are in the organic form and released slowly, topdressing is generally performed less often than conventional fertilizer treatments—as little as one or two times per year. It is possible to obtain a high quality turf with topdressing and eliminate the use of conventional fertilizer treatments; this is true especially if topdressing treatments are performed multiple times in the year (e.g., both in the spring and fall). Compost however will not necessarily adjust soil pH; therefore lime addition may be required. 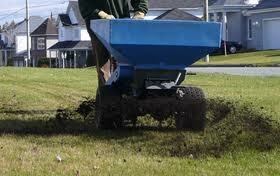 Whenever topdressing with compost, we suggest soil testing to determine soil levels and plant needs. We take care of that for you for a small additional cost. Soil organic matter is important for obtaining good turf growth. Recommended levels of organic matter will depend on the specific application; however regardless of soil type, increasing organic matter through compost can provide numerous benefits. Although the best time to add organic amendments such as compost is prior to planting, when topdressing, the organic matter is added without tilling or turning over the soil. 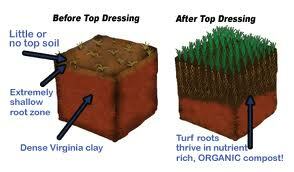 Thus topdressing turf areas allows the soil to be improved without removing or disturbing the turf. This is particularly important where disturbance could lead to erosion and soil loss. Improvements to soil structure obtained from the addition of organic matter have been linked to a wide variety of benefits. In the case of sandy soils, organic matter is essential for holding both water and nutrients. On the other hand, soils with high clay contents benefit with improved soil structure, reduced surface crusting, and compaction yielding better drainage. Increasing organic matter through compost topdressing has been shown to decrease soil bulk density and improve the ability of water to infiltrate into the soil. Improved soil structure and increased levels of soil organic matter can lead directly to reducing the need to irrigate turf areas. 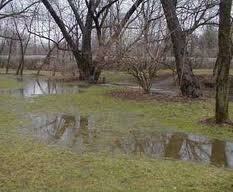 By increasing the amount of organic matter in soil, the ability of the soil to hold water is increased. Just by raising the overall level of organic matter by 1% increases the ability of an acre of soil to hold 16,500 gallons of water. In addition, the improved ability of turf areas to allow water to infiltrate into the soil results in less water running off following rain events. Thus addition of organic matter to soils can improve the ability of the soil not only to store water but also to absorb water. 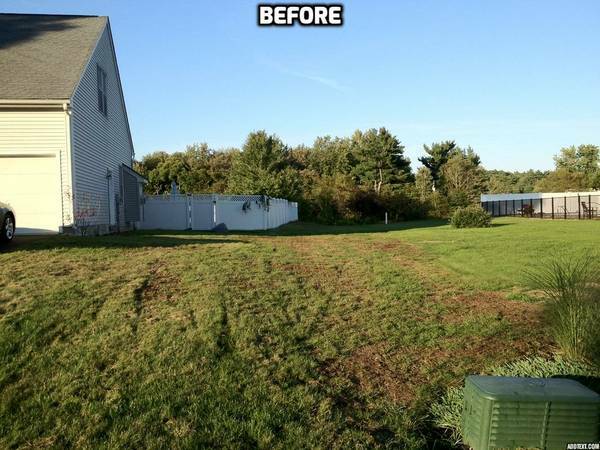 The impact on irrigation of athletic fields has been observed by Mike Cabral, public works manager at Devens, MA, who was able to reduce use of irrigation water by more than two thirds after starting a compost topdressing program. Recent research has shown that core aeration followed by topdressing had a significant positive result on soil water content and was an effective means of water conservation while maintaining “aesthetically appealing turfgrass.” Areas that received topdressing stayed greener longer after periods of drought. 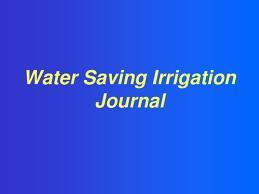 Topdressing also improved water infiltration even when core aeration was not performed. In addition compost topdressing resulted in lower temperatures in the turf canopy reducing stress. Thatch is the organic layer that forms between the soil and the actively growing grass. Although a normal component of turf, thatch can cause problems in highly managed turfgrass. 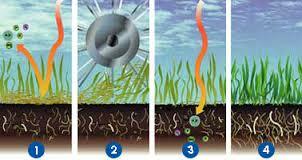 There is general recognition that topdressing can reduce accumulated thatch and reduce thatch levels. The compost promotes the growth of active microorganisms that decompose the thatch layer. One of the earliest recognized values obtained from topdressing golf greens was the creation of a smooth and level surface. For highly managed turf areas with closely cut grass, such as golf greens and tees, compost/sand mixes are routinely used for this purpose. In less highly managed situations, such as lawns and sports fields, topdressing will have a much less dramatic effect on the surface. Topdressing areas of sports fields that get extensive wear can improve the playing surface both by filling in divots and by building more dense plant growth. Improvements to turf quality and soil condition (e.g., reduced compaction) can lead to reducing injury risks on sports fields. Composts can support large and diverse populations of microorganisms. 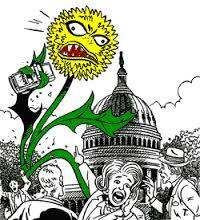 When properly made, the high temperatures associated with the composting process will kill plant pathogens as well as weed seeds. However as the compost cools, it will be readily colonized by microbes that can grow at normal soil temperatures. Compost applications have been repeatedly associated with reduced disease; studies with some common turf diseases, such as Dollar Spot, have shown that repeated use of compost of a variety of types can lead to reduced disease to the point that chemical controls can be reduced if not eliminated. Research suggests that characteristics of the compost presence of various microbes, and nutrition may be important factors in achieving disease control with compost. In the northeastern United States, compost has been used by many golf course managers for winter cover over greens and tees to prevent or reduce damage caused by ice and snow. Compost topdressing provides an insulating layer that prevents damage and allows the greens to recover more quickly in the spring. 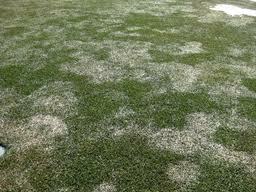 This practice has also been suggested as a means to control damage caused by various snow mold pathogens. Compost applied to the greens is believed to reduce disease through antagonistic microbes and provide nutrients which promote rapid recovery of the winter-damaged turf. Another of the benefits that has been documented from topdressing with compost is the reduction of weeds. This effect appears to be directly related to improvements in the density of grass providing a competitive advantage over the weeds. Although nutrient run off from turf is generally recognized as low in comparison with row crops, there is increasing concern that conventional fertilizers, especially when applied late in the season, can lead to nutrients entering surface or ground water. The use of organic sources of nutrients that are contained in compost has been shown to effectively reduce potential nutrient losses that may be associated with conventional fertilizers to levels equal to unfertilized areas. Other studies have shown that even when turf areas received high rates of compost, losses of both nitrogen and phosphorus were no greater than from areas that received no compost. Researchers concluded that when compost topdressing is performed in conjunction with soil testing and is based on plant nutrient requirements, there is little risk that nutrients will lead to increased nutrient run off. Perhaps most importantly research studies show that by improving turf shoot density and water infiltration (both common improvements observed when topdressing with compost), nutrient runoff can be significantly reduced. SO YOU WON'T BE DRINKING THE FERTILIZERS AND PESTICIDES INSTEAD OF YOUR LAWN USING THEM! If you made it through all the ten reasons to top dress then you must be convinced top dressing with compost will vastly improve your lawn. Feel free to give us a call or enter your info below for a free estimate! Give us your contact info and we'll call you right back!